Sachets containing resin beads that absorb algal toxins are used to monitor toxins in coastal waters. Photo by Meiling Roddam, UCSC. A new tool for tracking algal toxins is under development at UC Santa Cruz. The tool resembles a tea bag filled with sand and, like a tea bag, is soaked in water. The grains in the bag, though, are actually tiny porous resin beads that selectively absorb domoic acid, a naturally occurring neurotoxin that causes amnesic shellfish poisoning in people and seizures in marine mammals. 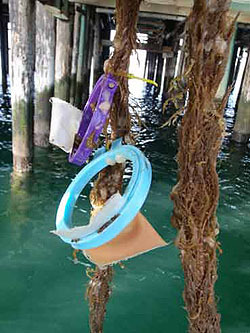 Scientists envision hanging the resin-filled sachets off piers and wharfs in California to continuously track nearshore toxin levels, similar to what is being done through sentinel "mussel watch" programs. The project is led by Raphael Kudela, a professor of ocean sciences at UCSC, and funded by the California Sea Grant program. "What we have done is produce a passive, quantitative man-made sentinel mussel," Kudela said. "But unlike a real mussel, our mussel is not sensitive to salinity extremes or vulnerable to red tides." The artificial mussel is an adaptation of a technology developed five years ago in New Zealand, known as SPATT, short for Solid Phase Absorption Toxin Testing. While the original SPATT was designed to absorb lipophilic (lipid-loving) algal neurotoxins such as saxitoxin, the causative agent of paralytic shellfish poisoning, the new SPATT comes with resin beads that absorb domoic acid, a hydrophilic molecule. The gist of the Sea Grant project was finding and testing this resin and a solvent for stripping domoic acid from it. "We hang both the original SPATT and the new SPATT from the Santa Cruz Wharf to track the full complement of lipophilic and hydrophilic algal toxins," said UCSC graduate student Jenny Lane. "The whole point is to track the comings and goings of toxins that we miss with weekly water sampling," added Meiling Roddam, a UCSC undergraduate who is also involved in the project. Domoic acid is a naturally occurring molecule produced by diatoms of the genus Pseudo-nitzschia. Mussels, oysters, and fishes (such as sardines and anchovies) that feed on algae can accumulate the toxin, causing poisoning in animals that eat them. A current limitation of SPATT is that it does not measure toxin levels within algal cells. Instead, it measures that small fraction of a toxin that leaks from cells into water. To measure the true total domoic acid content of a volume of water, the scientists are exploring the idea of pumping seawater samples into glass jars containing cell-lysing compounds. The resin sachets would then be placed in these jars. Kudela said he wants to measure domoic acid in cells because "organisms are not drinking domoic acid, they are ingesting cells that contain it." Besides working on the pumping and lysing system, the scientists plan to use the current iteration of SPATT to trace the sources of freshwater algal toxins called microcystins (which are also hydrophilic molecules) that marine biologists believe have killed at least five federally protected sea otters in Monterey Bay. "We know where the otters live and where they eat, but we have no idea where the toxins are coming from," Kudela said. "The idea is to put the resin out in rivers, creeks and freshwater overflows that discharge into Monterey Bay."